Korean exports, the engine of the economy, continue to stutter, with a 11.2% fall reported in April. It mark’s the 16th successive month that exports, which account for 50% of the Hermit Kingdom’s economy, have fallen. South Korea’s economy is intrinsically linked with that of China. Combined with a fall away in western demand, the consequences of China’s slowdown have been dire. The trade ministry attempted to inject some positivity into the story, claiming that with a higher number of holidays in April “conditions for South Korean exports cannot be said to have deteriorated in April”. While fewer working days may account for the increase in the extent of the decline from 8.2% in March, the overall picture is not as easily glossed over. Imports fell by 14.9% in April, meaning that Korea maintains the trade surplus it has kept since 2012 (US$8.8bn). While Korea is a net importer of energy, it is an exporter of refined petrochemical products and derivatives. Therefore, the declining oil price is a two-sided story: it is saving money on the import, but losing money on the final product. Exports of petrochemical products fell by 14.5% in the month of April, while derivative products were down by 10.8%. But it is China that remains the largest concern for Korea. Exports to its largest trading partner fell by fell by 18.4% in April, year on year, which marks the 10th consecutive decline. Exports to the US dropped by 6.6%. In recent years, outgoing President Park Geun-hye’s government has been attempting to decrease the country’s dependency on China, but the process is a slow one. “Korea is exploring alternative markets beyond China, as reflected in free trade agreements (FTAs) with Vietnam and New Zealand that came into effect in recent months, ongoing FTAs negotiations with Central America, Mexico and a more recent push towards Iran. “Any impact from the Trans-Pacific Partnership (TPP), and the Regional Comprehensive Economic Partnership (RCEP) on Korea’s exports would be long-term in nature. Membership in these pacts would at least help maintain Korea’s export competitiveness,” Krystal Tan, Asia analyst at Capital Economics, tells GTR. The push towards Asean, the world’s next frontier in consumer imports, would make sense and indeed, in April, Korea’s exports to the bloc grew by 7.1%. The push to Iran was cemented further this week, with the announcement that oil imports have grown fourfold since January, with Tehran hoping to triple the annual bilateral trade this year. Iran’s oil minister Bijan Zanganeh said Seoul imported 400,000 barrels of oil a day in April. 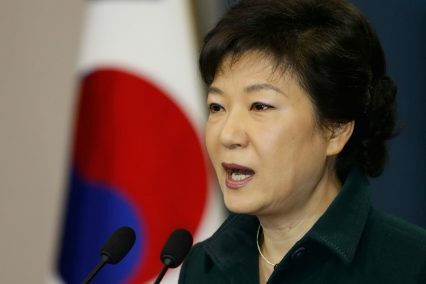 President Park led a trade delegation to Tehran this week and is set to sign a range of trade agreements with her Iranian counterparts, worth billions of dollars. No official confirmation has been forthcoming, but Al Jazeera reports that deals on trade and energy worth more than US$10bn have already been signed. Korea is the world’s fifth-largest importer of crude oil and maintained cordial trading relations with Iran throughout the sanctioned years, despite pressure from the US. Meanwhile, on the home front, Korea has been encouraged to move away from some of its strongest industries. It is an industrial powerhouse, renowned for its strength in sectors such as shipbuilding, but has been looking to expand services and consumer goods sectors in recent years.